For so long the Church in America have preached to themselves they so desperately want to be like Jesus. They wanted to be like the Apostles, they are beginning to get their wish. We are being persecuted like Jesus. Our rights are being stripped away like Paul. The government is encroaching on our God-given freedoms and what is our church leaders doing? Absolutely nothing to stop it. As a matter of fact, some are being complicit with the government and are leading us into the slaughter house themselves not realizing that after the government disposes of us, that they’re next. Don’t believe me? 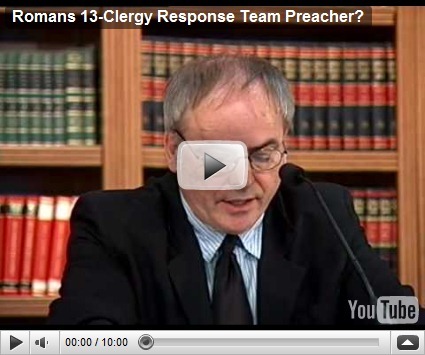 In 2006, the Department of Homeland Security (DHS) has created a program called the Clergy Response Team. It is made up of church leaders of local congregations whose design is to force you to submit to the government citing Romans 13:1-2 as a Scriptural reference. At the time of this posting there are roughly 26,000 clergy leaders in America who have signed up for this program. This is a culmination of what I said in previous entries. For more on the Romans 13 “lie” see my entry “Pick a Side, The Lord Already Has”. Below is a video that depicts the very subject matter I have explained in the above paragraph Pay very close attention that the “Pastor” does not cite Romans 13:3-4. I would urge you to after watching this video, to get your Pastor/Priest response on if the government does not address evil actions in our country, what are we to do as believers? If their response is like the person in the video, you may want to consider changing churches – quickly. I have said it quite frequently, but now more than ever it bears repeating: “Check your government before your government checks you”. I would urge – even beg of you to share what I saying with those of like minded faith and ALL OUF US get to the polls in November to stop this diabolical scheme to usurp the very rights and freedoms God have given us as Americans. Regardless of how this turns out after Election Day, one thing will remain for the Church in America: We will all stand before God, both the small and the great and will have to answer this one question, “What did you do with the freedom that I gave you”? What will be YOUR response to God? On that day, there will be no one you can blame. There will be no one you can point to. You will stand before Him naked and ashamed or naked and justified. ← Is There A Glaucoma Outbreak in Washington D.C.? When you read on to verse six, it also talks about Gods servants. Our leaders are far from that. Jane, this type of preacher is commonplace from my vantage point. I believe he the rule and not the exception.